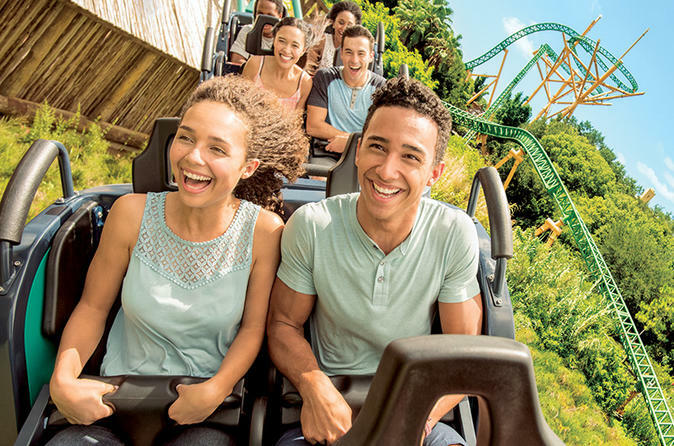 One of the top zoos in North America, Busch Gardens brings you face-to-face with more exotic and endangered animals than any destination outside of Africa. Prepare yourself for heart-pounding excitement with SheiKra - America's first dive coaster. Discover a colorful village nestled among towering trees, explore a 3-story play land of climbing nets and exploration tunnels, soar above the treetops on a zip line adventure or launch into the sky from inside a 35-foot (10 meter) waterfall. Then, come face-to-face with orangutans and test your strength in a tug of war with a Bengal tiger, all in Jungala - the only jungle in the world that plays with you. For additional fun, choose from combo ticket options with SeaWorld Orlando, Adventure island Tampa and Aquatica Orlando! All-day parking and unlimited parking packages are also available. At SeaWorld Orlando, every encounter is a new adventure when you come face-to-face with the friendly dolphins, magnificent white beluga whales and playful penguins of SeaWorld Orlando. Experience life far under the sea as you feed dolphins, get up close to a polar bear and count the teeth on a shark! Of course, there's also the mythical rush of the Journey To Atlantis® water coaster and Shamu®! Introducing Aquatica Orlando - a whimsical, one-of-a-kind waterpark that's only in Orlando and could only come from SeaWorld. One river floats you through an undersea world of colorful fish, and another races you into rolling rapids. Slides spin and soak you, and the incredible signature ride of two awesome, enclosed tube slides sends you speeding through a lively lagoon filled with playful, black and white Commerson's dolphins. Delight in the serene-to-extreme waters in the gigantic double wave pools and soak in the sun (or the cooling shade) on the white sand beach. Escape into water-soaked excitement at Adventure Island! Ease into island time in a place where you can enjoy corkscrew slides, waterfalls, a giant wave pool, a rambling river and more! Special Offer - Book and save 24% on a Single Day Ticket compared to the local supplier's prices! - Book Now!